For any of you that aren’t aware, each month we donate $1 of every bunch sold to a cause close to our heart. 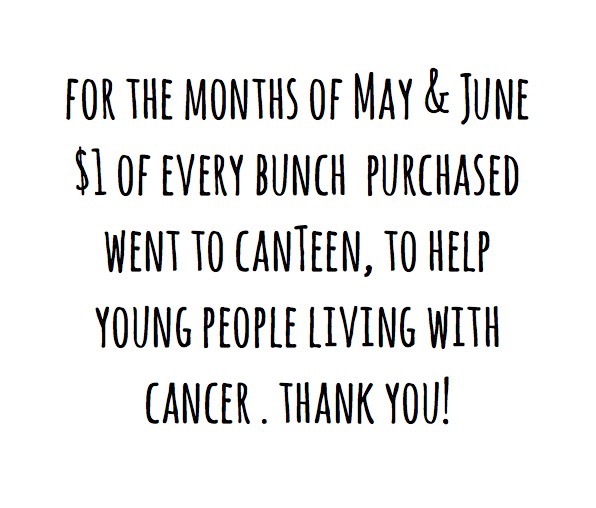 For the months of May and June we donated to CanTeen Australia. CanTeen supports young people living with cancer and helps them cope with the physical, emotional and practical impact of living with cancer. CanTeen helps to provide funding for specialist hospital care, counselling and individual assistance as well as information and peer support programs. If there is cause close to your heart please let us know. We want to spread the love! Thanks again for supporting The Flower Run. Thats Great Alyssa! How much was raised? Have you got a charity booked for September? Muscular Dystrophy WA (MDWA) is having their 50 Year Anniversary Ball. Could be a chance to partner up for the ball/month?